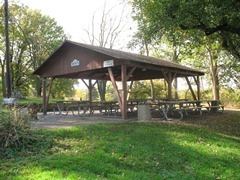 2019 Pavilion Rental Dates: The first day of pavilion rentals for the 2019 season (May-September) for Moon Township residents will be on Monday, February 11 at 8:30 a.m. Reservations must be made in person at the Moon Township Municipal Building. Thereafter, reservations will take place at the Parks and Recreation office at Moon Park. Non-residents may reserve pavilions beginning Tuesday, February 19. All deposits and fees are due at the time of rental. All pavilions have electric, water, horseshoe pits, and at least one grill. The Robin Hill Center is available for rental of weddings, reunions, graduation parties and other similar events for groups up to 110 persons. The facility is available to be rented for an eight (8) hour period. Additional time may be requested for an additional fee. Reservations for Robin Hill are made year round, up to one year in advance to the first business day of the month. For example, any rental date in May 2020 can be reserved as early as the first business day in May of 2019. All reservations must be done in person at the Moon Parks and Recreation office in Moon Park, located at 1350 Ewing Road next to the basketball courts. Please call 412.262.1703 for more information. To get resident rates, the person who signs the contract and pays the deposit must be a resident of Moon Township. To reserve the Robin Hill Center, schedule a tour of the Robin Hill Center, please call 412-262-1703 or email info@moonparks.org. Amount of required deposit is $150.00 and is necessary to secure your request for rental. Should you cancel prior to 30 days of your event, you will be charged a cancellation fee ($75.00). If we do not receive a 30 day notice, you will forfeit all rental fees paid. Should there be damages; the deposit will be used for the repair. If damages exceed $150.00, the renter will be charged accordingly. The deposit is in addition to the rental fee and is refundable only if all conditions to this agreement are met. Rental fees are based on an eight (8) consecutive hour usage of renter’s choice, between 11 a.m. & 11 p.m.
Renter may also request additional time. The Gazebo is only available when renting the Center. Friday Night Before rental is only available to Saturday Renter. Holiday availability is based on availability of staff. Rental Hours must be finalized thirty (30) days prior to event. All payments must be in the name of the renter on the agreement. Full payment of rental fee is due no later than thirty (30) days prior to the use of the facility. If fees are NOT paid within 30 days, the date will become available to rent and agreement is no longer valid.